اقتدارنژاد, ندا, منصوری, حمیدرضا, نصرتی, بابک. (1394). بررسی اثر شرایط پرس بر خصوصیات تخته خرده چوب ساخته شده با چسب طبیعی تانن متراکم میموزا. مجله صنایع چوب و کاغذ ایران, 6(2), 193-201. ندا اقتدارنژاد; حمیدرضا منصوری; بابک نصرتی. "بررسی اثر شرایط پرس بر خصوصیات تخته خرده چوب ساخته شده با چسب طبیعی تانن متراکم میموزا". مجله صنایع چوب و کاغذ ایران, 6, 2, 1394, 193-201. اقتدارنژاد, ندا, منصوری, حمیدرضا, نصرتی, بابک. (1394). 'بررسی اثر شرایط پرس بر خصوصیات تخته خرده چوب ساخته شده با چسب طبیعی تانن متراکم میموزا', مجله صنایع چوب و کاغذ ایران, 6(2), pp. 193-201. اقتدارنژاد, ندا, منصوری, حمیدرضا, نصرتی, بابک. بررسی اثر شرایط پرس بر خصوصیات تخته خرده چوب ساخته شده با چسب طبیعی تانن متراکم میموزا. مجله صنایع چوب و کاغذ ایران, 1394; 6(2): 193-201. در این بررسی تاثیر شرایط پرس بر روی تخته خرده چوب‌های سبز و دوست‌دار محیط زیست، ساخته شده از چسب طبیعی تانن متراکم گونه میموزا مورد مطالعه قرار گرفت. دمای پرس ثابت و 200 درجه سانتیگراد در نظر گرفته شد. زمان پرس در چهار سطح 3، 4، 5 و 7 دقیقه و فشار پرس در سه سطح 15، 18 و 22 کیلوگرم بر سانتی‌متر مربع به عنوان عوامل متغیر در نظر گرفته شد. نتایج نشان داد که بهترین تیمار از نظر مقاومت چسبندگی داخلی و واکشیدگی ضخامتی تیماری است که در فشار پرس 18 کیلوگرم بر سانتی‌متر مربع و زمان 5 دقیقه انجام گرفته است. در این تیمار مقدار مقاومت چسبندگی داخلی 0.59 مگا پاسکال به دست آمد و درصد واکشیدگی ضخامت ( 2 و 24 ساعت) نسبت به سایر تیمارها کمتر بود. نتایج مربوط به محاسبه جذب آب نشان داد که میزان جذب آب با افزایش فشار پرس تا سطح 22 کیلو گرم بر سانتی متر مربع کاهش می یابد. .
 Li, K., Geng, X., Simonsen, J. and Karchesy, J., 2004. Novel wood adhesives from condensed tannins and polyethylenimine. International Journal of Adhesion and Adhesives, 24(4): 327-333. Kim, S., 2009. Environment-friendly adhesives for surface bonding of wood-based flooring using natural tannin to reduce formaldehyde and TVOC emission. Bioresource Technology, 100(2): 744-748. Umemura, K., Inoue, A. and Kawai, S., 2003. Development of new natural polymer-based wood adhesives I: dry bond strength and water resistanse of kongacglucomanan chitosan and their composites. Journal of Wood Science, 49: 221-226. Nazarnejad, N., 2011. The manufacture of particleboard with unusual connections. Journal of Wood and Paper Science Research, 26 (1): 1-9. (In Persian). Hoong, Y.B., Paridah, M.T., Luqman, C.A., Koh, M.P. and Loh, Y.F., 2009. Fortification of sulfited tannin from the bark of Acacia mangium with phenol–formaldehyde for use as plywood adhesive. Industrial Crops and Products, 30(3) : 416–421. Nemli, G., Kırcı, H. and Temiz, A., 2004. Influence of impregnating wood particles with mimosa bark extract on some properties of particleboard. Industrial Crops and Products, 20(3): 339–344. Zivkovic, J., Mujic, I., Zekovic, Z., Nikolic, G., Vidovic, S. and Mujic, A., 2009. Extraction and analysis of condenced tannis in castanea sativa mill. Journal of Central Europeon Agriculture, 10(3): 283-288. Asghari, J. and Mazaheri Tehrani, M., 2009. Tannin extracted from the leaves of eucalyptus and Trymystryn of nutmeg Hindi using microwave radiation. Journal of Medicinal and Aromatic Plants investigations. 26(2): 185-190. (In Persian). Dost Hosseini, k., 2007. 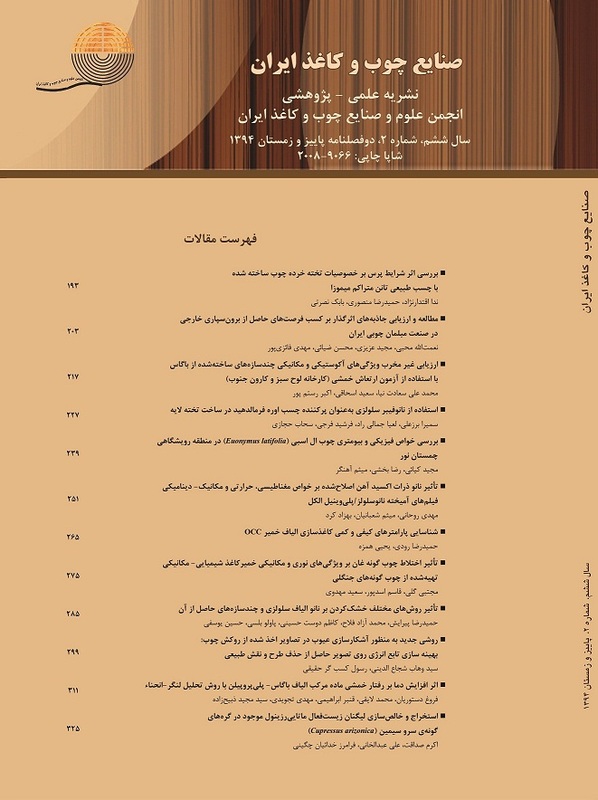 Production Technology and Application, sheets of compressed wood, Tehran University Press, Page 714. (In Persian). Lei-feng, Z., Yu, L., Zheng-dong, X., Ya-zhuo, Z. and Fang, Z., 2011. State of research and trends in development of wood adhesive. Forestry studies china, 13(4): 321-326. Grigoriou, A.H., 1997. Bark extractive from pinus halepensis mill fortified with polymeric diisocyanate for exterior grade particleboard. J. HolzalsRoh- und werkstoff, 55(4): 269-274. Osman, Z., 2011. Thermomechanical analysis of the tannins of Acacia Nilotica spp. Nilotica as a rapid tool for the evealuaion of wood-based adhesives. Journal of Thermal Analysis and Calorimetry, 107(2): 945-949. Ballerini, A., Despres, A. and Pizzi, A., 2005. Non-toxic, zeromission tannin glyoxal adhesives wood panels. Holz Als Roh-Und Werstoff, 63(6): 477-478. Bisanada, E.N.T., Ogola, W.O. and Tesha, J.V., 2003. Characterisation of tannin resin blend for particle board applications. Cement and concrete composites, 25(6): 593-598. Ndazi, B., Tesha, J.V., Karlsson, S. and Bisanda, E.T.N., 2006. Production of rice husks composites with Acacia mimosa tannin - based resin. Journal of Materials Science, 41(21): 6978 – 6983. Sedano-Mendoza, M. Navarrete, P. and Pizzi, A., 2010. Effect of layers relative moisture content on the IB strength of pine tannin bonded particleboard. Eur. J. Wood Prod, 68: 355–357. Pizzi, A., Stracke, P. and Trosa, A., 1997. Industrial tannin/hexamine low-emission exterior particle board. Holz Als Roh-Und Werstoff, 60: 65-72. Pizzi, A., Valenezuela, J. and Westemeyer, C., 1986. Low formaldeyde emission, fast pressing, pine and pecan tannin adhesives for exterior particleboard. Holz Als Roh-Und Werstoff, 52: 311-315. European Standard, Particleboards-Specifications-Part 3: Requirementsfor Boards for Interior Fitments (Including Furniture) for Use in Dry Conditions. European Standardization Committee, EN 312-3. 2010. European Standard, Particleboards-Specifications-Part 2: Requirementsfor General-Purpose Boards for Use in Dry Conditions. European Standardization Committee, Brussell, EN 312-2. 2010. European Standard, Particleboards and fiberboards of swelling in thickness after immersion. Europen standardization Committee, Brussell, EN 317. 2008. European Standard, Wood based panels, determination of tensile strength perpendicular to panel of of board. European Standardization Committee, Brussell, EN 319. 2008.